Hello everyone! This topic will be a little different from what you're used to. Basically, this topic is mainly for rogues, to explore and colonize. It is the biggest area of free land outside of the Drakis Sanctuary, otherwise known as Lake Burn. No dragon owns this land, so it is considered rogues land. I like to consider rogues the most diverse, since they are able to travel around and claim land as their own. 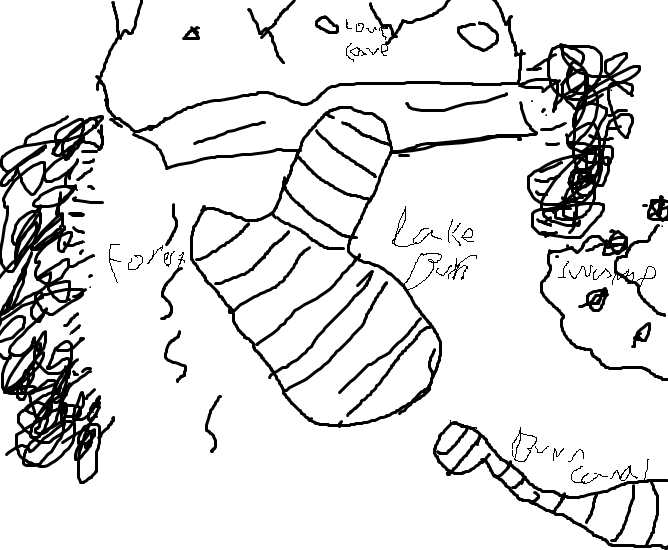 Now, here is a quick sketch map of Lake Burn, which will be regularly updated. Now, if you wish to claim land, or have a bigger view of Lake Burn, PM me or my various accounts. Now, this isn't limited to rogues. Tribal dragons feel free to visit this area as well, though because of federal law, they aren't allowed to claim the area. And I will add one of these with each new roleplay. Please note you don't need to use detail when posting here. Short and sweet posts are very much welcomed, but if someone can't keep up with your pace, you should only allow players who can. Anyway, enjoy Lake Burn, my fellow rogues! More to be added, always! It was morning. Exactly five days after Rayla had became a rogue. Turns out Sterlynn had been living near lake burn, in a beautiful ice-home. The cave had been very small, just barely big enough for Thirahan and Rayla to squeeze through. Sterlynn hadn't expected company, so he hadn't made the cave bigger than he was. The cavern where he lived was big, just the right size to house three dragons. It was all encased in ice, And Ster said he had built it himself. Rayla had loved being on her own with her two brothers, with no rules and no annoying moms to tell her what to do. Now it was Rayla's turn to do the hunting, and she was currently down by the lake. Zya was traveling around following the tunnel routes, he hadn't heard from Chibi for quite some time now, he felt worried for her but he needed to explore, to help calm his mind. It seemed like the tunnel which he was following was close to Lake burn, when spotting the large body of water he noticed a figure on the lake side. Since he wasn't very large or knew the area very well he decided to stay cautious stopping close to the tree line he watched as the dragon was eating a meal. Trying not to make noise he jumped up towards a high branch to get a better view. Rayla flicked her ear as she ate. She heard something, but she wasn't worried about it. She was a rogue now, that meant she didn't need to guard anything. Well, unless Ster had territory of his own that he had claimed. She wasn't very familiar with his territory yet, and still had to be given a thorough tour of what he called his territory. He said he had to do daily border patrols of his area, but his territory was very small because he prefered to gather his food and store it, so he wouldn't need to make multiple trips. So he didn't really need to worry about intruders. Rayla still wasn't aware of Zy. Zya started to feel a little bored, continuing to think of Chibi he looked behind him as he thought of leaving towards the north. Suddenly he lost his grip of the branch, as he tried to balance himself it was too late, plummeting towards the ground he quickly span around so his wings would stop the fall. Landing softly onto the ground he frowned after a brief panic he turned his gaze back towards the rogue dragon, no doubt he created noise to alert the dragon. Rayla stopped eating, and straightened. She spun her head around in the direction of the noise, and blinked. She spotted a black dragon. Was it a NightWing? It was far too small to be a NightWing.... then again, from what Rayla had heard of her mother, her mother had been pretty small as well. Maybe this dragon was a SkyWing? Or a rogue? Rayla wanted to growl at them for disturbing her meal, but she was more curious than angry. Standing up, she trotted over to them, "Hey!" she snapped, "You alright?" Zya started to panic, as he heard a raised voice from the rogue. As he pulled himself back to his feet he suddenly felt a shock of pain, it was his right rear leg, badly strained from the fall. This only made Zya crash onto his behind growling slightly from the pain, turning his gaze he spotted what the problem was. He didn't want to linger around with a potential dangerous dragon close by, of course he didn't know how the larger dragon would react. Rayla narrowed her eyes at the smaller dragon. She was about three, maybe even four times his size. He seemed injured. Rayla stood at about twenty seven to twenty nine feet tall, and her brother (Thirahan) was bigger than she was, at about 30 feet, maybe larger. When she saw the dragon scurrying about, she felt pity for him. Using her paw, she pinned him down so he'd stop squirming about, and spoke up, "Hey! Calm down! You want to get your paw more broken than it already is?" she growled. Zya eyes widened as he spotted the dragon coming towards him, this only made him panic even more as he tried to open his wings to get away, he was suddenly pounced, growling in fear, could this be the end? he thought, as he heard the her voice telling him to calm down he did so, listening more closely to her words as she held him down, being much larger than him he couldn't escape her grasp. Only to reply with fear in his voice, "P...Please let me go...."
Rayla rolled her eyes at the little dragon, but did as he asked. Why were some dragons so gosh darn small? She growled at him, "what's a tiny dragon like you doing out in the rogue lands?" She wasn't really that interested, but she didn't have much else better to do. frowned as Rayla spoke to him saying that he was tiny, speaking nervously "I''m... trying to find my friend.... *frown* I havn't seen her for sometime.." as he curled his tail round his leg trying to support it. Rayla sighed, then growled, [/color]c]"Well, you shouldn't hang around in trees waiting for her to show up, now should you? "[/color] Rayla trotted off, picked up her fish, and brought it back to Zy, "here, eat this. Rayla dropped the fish at his feet. Zya looked with a slightly confused look, was this rogue trying to help him? he pondered as a fresh fish was dropped at his feet. Smiling slightly he asked "Whats your name? Mines Zyailor...." as he swiftly grabbed the fish and started to chew at its flesh. It was quite rare having fish for him. Rayla chuckled, "My name's Rayla, Demi god and daughter of Trinyah, goddess of beauty, and Arkhor, god of tides," Rayla puffed out her chest, presenting her title proudly. 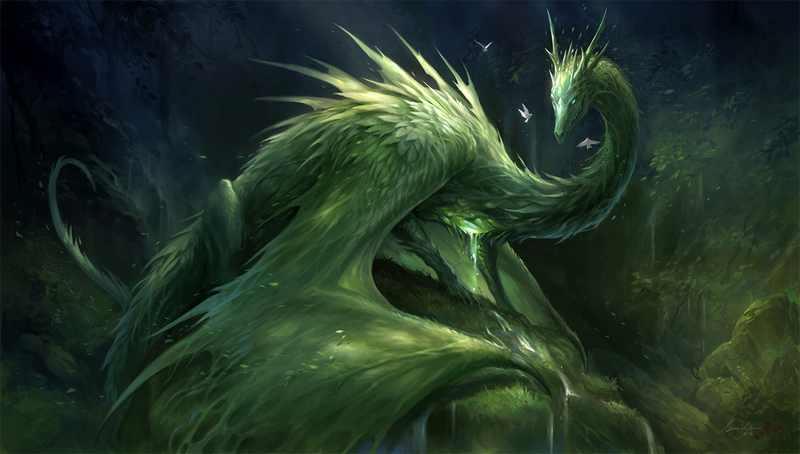 Her mother had been the most beautiful dragoness out there! Maybe that's where she had gotten her looks from, thought Rayla with a chuckle. Zya noticed as Rayla was almost bragging about her heritage, frowning slightly he replied "I'm no one special...Thanks for the fish..." As he tried to get back onto his feet he wobbled slightly but managed to keep his balance. She didn't seem to be a threat. Rayla nodded, "Yea, I'm pretty special. I'm following my mom's footsteps, and one day I'll be a goddess, just like her!" Rayla announced proudly, chuckling to herself as she thought about being a goddess. Zya's eyes widen as she mentioned goddess, "W...Wait your gona be a goddess?" looking slightly confused he couldn't believe that he was talking to a 'goddess' to be, smiling slightly he continued "How come your alone out here then?" Rayla shrugs, "I'm not alone. I'm living with my two brothers, Sterlynn and Thirahan. Thira is my bbf, best bro forever, and Ster's my super smart and serious younger bro. He can hear dead people!" Rayla laughed, since she could still barely believe it. Zya looked slightly surprised, she surely wasn't that old, maybe around his own age. "How come not your parents? if you don't mind me asking.... I never really had any parents..." frowning slightly with a sad look. "Pffft, I don't need parents!" Said Rayla. Zya frowned again as he nervously shook he tail as there was an awkward pause. "You havn't seen a small white dragon before? Thats who I'm looking for..." he hoped that his luck would change. Rayla shook her head, "sorry, haven't seen any little white dragons around here. But you seem pretty cool. Why not hang out with me instead?" Said Rayla, smirking at Zy. Rayla was bored anyway. Nothing like spending the day with a stranger to get you in-bored! Zya frowned from her response, but his ears perked when she mentioned him staying with her for bit, well it couldn't hurt she certainly seemed friendly. It would take a while for his leg to get better anyways. "O...Ok..." still feeling nervous he started to calm down. Rayla smirked at Zyailor, digging her claws casually in to the ground in a kneading motion, purring happily. Well, now she could have something to do that wasn't based around her brothers! Rayla had never felt weird around boys before, and probably never would. She preferred boys over females, because they were much rougher when she was play fighting with them. She had always enjoyed play fighting with her dad and her little brother Delphin. Not to mention her brother Thirahan and Vaynad, though Rayla had always been a little to rough for Vaynad..... and Sterlynn didn't seem to like to roughhouse, which Rayla didn't enjoy about his overly serious personality. Thinking about Vaynad made Rayla sad. About ten years ago, maybe longer, Vaynad disappeared. He had been gone ever since, and Rayla wasn't sure what had happened to him. He hadn't even been a trainee yet! Now Rayla was about seventeen years old..... well, who knew, maybe he'd show up again the same way Sterlynn had! Though Rayla with a chuckle. She then turned back to Zyailor, and laid down beside him, and decided to start a casual conversation. "Hey, are you a SkyWing? Or are you a NightWing? I can't tell because you're too small to be a NightWing, but you're black, and SkyWings aren't black! Urg! It's confusing!" shouted Rayla, rolling onto her back and staring up at the sky, kicking her legs up in the air. If you couldn't already tell, Rayla was pretty hyper after eating that tuna. It must have had a lot of protein in it! Rayla wasn't really one to tell lies, so she usually ended up speaking her mind about everything, even if it might be considered rude to the other dragon. Zya managed to carefully sit down, being careful not to damage his leg further. Soon enough the larger rogue laid close by, it was strange for him, due to not having much contact with other dragons, apart from Chibi and a few skywings. As Rayla asked him a question about his tribe, he nervously smiled and replied "Er... Skywing... I havn't seen a Nightwing before.." as he continued, "So... are you a seawing?" she did look a lot like one except from a few features which he didn't realize they where from an Icewing.